Barely one month after my Pa passed, so did my Gram today; on July 27, 2010 just after 4 in the morning after a massive stroke at lunchtime the day before. My heart creeps up into my mouth when I think of so much loss in such a short time; it is barely manageable when I allow myself to think about it. Instead of just mourning, however, I feel I need to tell my story of my wonderful Gram. When I was born my five year old brother, Mark, fell ill with a serious case of meningitis which put my family into a state of disarray; a new born plus a gravely ill child – what a nightmare. Thankfully, my parents had my Gram & Pa who looked after me when necessary; while my parents went to and from the hospital to watch Mark’s meningitis threaten to overwhelm him. It took a while but fortunately my brother survived and lives a wonderful life today. 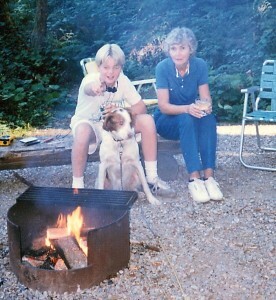 Throughout that time, I am sure my parents would never have known what to do without my Gram and Pa to fall back on. And so my wonderful connection to my grandparents began… I spent many evenings and many days in their home throughout my life and I enjoyed it immensely. Â» My Gram was a brilliant woman. To this day her name is listed high on a plaque at my high school (yes I went to the same one she did – Oak Bay High) as one of the first who ever achieved top honors (I believe that is straight A+’s) and excelled in extra-curricular activities (I hope I am not too off on this – my memory is a bit muddy). She went on in life to be active in countless organizations and she even joined some confidential woman’s league that paved the way for many women to succeed through financial support among other things; she never told me the name of it. Anyway, suffice it to say, she was more than qualified to be my tutor throughout all of my elementary years and part of my junior high years.Â I spent hours upon hours with her as she helped me with my math, pushed me in my writing (which, honestly, is often better than this!) and taught me French (she was excellent with Latin too). I am quite certain that without my Gram, I would be in a different place today in my life. Surely, I would not have had as many happy memories without her in my life. Â» She and my Pa would tease me about the days when I had my own boat and how I conveniently invited my Pa out fishing whenever I didn’t have enough money to buy gas… (as we got to the boat) “hey Pa, I think we need some gas for the boat”… heh, he always had a funny response and my Gram would tease me delightfully the next time I saw her. Â» I remember my Pa and my Gram reading to me before bed in their tiny, cozy guest room when I was little. I remember the warm yellow glow of light wrapped around us as one of them eloquently read selections of great stories (I wish I could remember what) and I lay cozily in the fresh warm sheets. 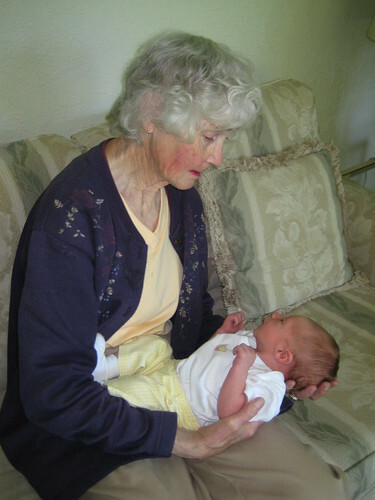 Â» My Gram got to meet her great grandchild – it was such a wonderful moment. Â» My favourite recent memory was when we were talking about my Pa’s passing and we got a chance to say how much we meant to each other. It was a great moment and I am very glad we had the chance to do that before she passed just a week later. 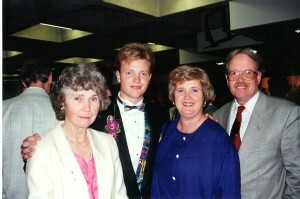 Gram’sÂ time has passed and she will live on in my memory and those of the rest of her loving family forever. The next few months and possibly years will be the hardest though; I am constantly finding myself wanting to call like I used to, to fill her in on life and enjoying immensely her wonder at the latest technology that I loved so much to show and discuss. I think I will stop here… honestly, I could go on and on. She was a wonderful grandmother. I love you Gram, I miss you. This entry was posted in Family, Personal, Profound and tagged "Audrey MacNeill", "Great Grandmother", Eulogy, Grandmother by rossdunn. Bookmark the permalink.